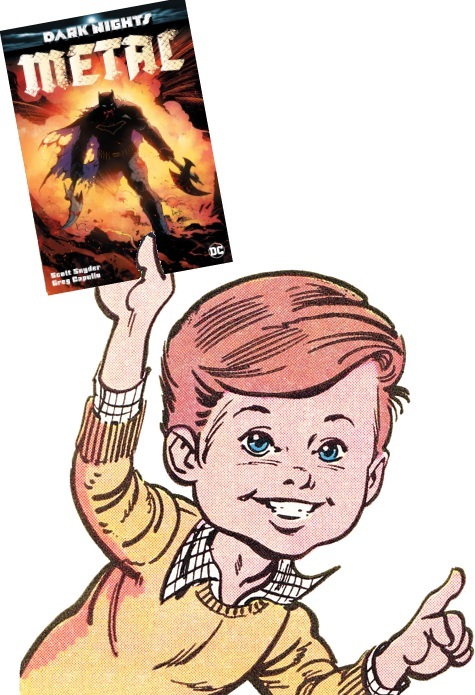 Despite my slight reservations over the title – seriously, Dark Nights: Metal just sounds like the worst 80s heavy metal album ever and I should know, I owned more than my fair share of them – the more I’m hearing from Scott Snyder about DC’s next big event gives me a great deal of hope. This article reveals that it’ll be six issues long, starting in August and with no need to read any tie-ins. I have no doubt DC will have other series cross over with it as well as spin off vaguely connected miniseries like they did with Final Crisis – did we really need Final Crisis Aftermath: Escape? – but it’s good to see a distinct event planned. He mentions in that article that “Metal is a DC wide event … It’s not a bat family book. It’s Justice League+” which is reassuring for me as I’m not a Bat-book reader so have missed everything he’s done on the Batman books over the last few years, though I hear it’s very good. And above all, it’s going to be fun. Even with terror and nightmares, it won’t be grim. Dark Nights: Metal will be celebratory, huge and crazy. I’ve said it before: I am going for out-of-control dinosaurs and lasers. With a bit of luck (and if I can pull my finger out) I can finally finish the War of The Gods annotations and be ready for this series. Posted on Friday, April 7, 2017 Wednesday, April 5, 2017 by GaryPosted in UncategorizedTagged Dark Days.